Above Lerici and the Gulf of La Spezia: A Hike Exploring 'La Farfalla Dorata', Early Farming, An Abandoned Church, a Forgotten Village, and a Quarry. The abandoned church of San Lorenzo di Caprione. On the Caprione Promontory in Lerici, Liguria. Cobbling together an incomplete past for an entire village will be our task and our pleasure on this hike around the ruins of San Lorenzo di Caprione. We'll try to imagine some of its past from a few paper records, from the ruins of a church and houses, from stonewalled lanes and fields, and from a menhir and an ancient millstone. The hike is on the Caprione Promontory - Lerici's peninsula - in southern Liguria, not far from Sarzana (see Getting There below). The village of San Lorenzo is really old, but little is known of the town's beginnings or of its demise. In a discrete location hidden from the sea, we know it was the refuge for Lerici in the time of the Saracen raids of the middle ages. It's mentioned in religious records in the 12th and 13th centuries, and in the 16th century a census listed 100 households. Life could not have been easy - although the area includes some level fields for farming and at least one water source, it's also very rocky. The Hike. The basic walk we describe in the forest and the macchia* takes less than an hour. It's easy and suitable for picnics and supervised children. There are many shady sections and some views but no steep parts, no services, and no water. The hike is a circle but it can be extended to almost any length thanks to the extensive trail network here. (see More Info below). Vaulted apse of San Lorenzo di Caprione. Formerly frescoed. To reach our starting point, turn to the south at a sign 'Monti San Lorenzo' on the SP331 which runs between Lerici and Romito Magra. Coming from the roundabout nearest Lerici, it's the second right. This narrow road - one lane wide with periodic pull offs - climbs the beautiful, shady gorge of the Canale dei Sardi. After a sharp bend, a cluster of modern homes appears. Park as you can - start hiking to the right on the far side of the settlement. It is signed 'San Lorenzo Collegamento Sentiero 1' - see the photo. (The number one here is shorthand for CAI-411). To The Church. The road turns from asphalt to dirt as you walk south past secluded homes and small farms. You can tell some history is lurking from the random ruined walls and mounds of stones covered with vegetation. After 10 minutes, turn right on CAI-411 at a 'T' intersection, and, in another minute, the ruins of San Lorenzo church appear. (see Church History below). The scene is beautiful in its desolation, and it's hard to believe that so little history was preserved. Even the purpose of the substantial ruins around the church remain a mystery. 'Golden Butterfly' at Solstice. Photo: Walter Bilotti, Lerici. To the Menhir & Seggio. After exploring the church area, make a short detour to see two ancient sites, following the path to the left signed CAI-415, CAI-417 for about 100 meters. The first site is a menhir consisting of four giant rocks which some theorize were erected or used to mark the solstice. 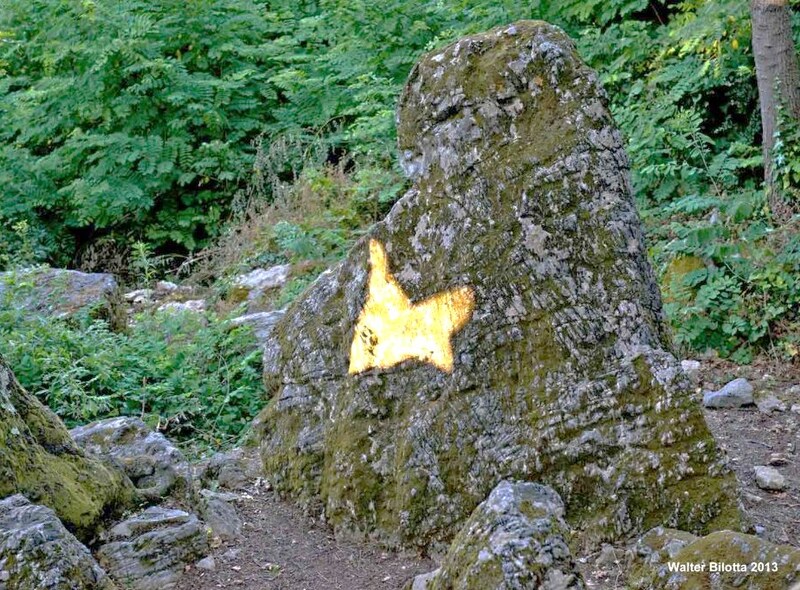 The spaces between three of the rocks create a 'golden butterfly' shaped light on the fourth rock for about 15 days before and after the summer solstice. (See Farfalla Dorata below). After your stop there, walk downhill another 50 meters. On the right is an astonishing block of stone with an arc carved deeply in to it. This is a rare example of an early grain grinding method (See Macina a Remo below). On the way back to the church, you can make out the ruins of a large house on the right. Through Forest & Macchia* Returning to the church, continue on CAI-411. This is a nice section through the forest with a chorus of birds for entertainment and encouragement. The rocky ruins make it seem populated as you walk uphill. Alongside the trail there seems to be an old lane with stone walls on both sides, and there are more mystery mounds. At one point a long and large stone wall leads purposefully straight into the woods. We followed one of the many little trails leading off to the right and found a couple of small little stone buildings almost intact. About 10 minutes from the church, just as you reach a landscape of Mediterranean macchia with views, there's a trail that connects to CAI-467 marked CAI-Collegamento 467 (see photo). This is your decision point: you can turn right to start back as we describe, or you can continue straight toward Rochetta and Campo di Gia as long as you wish. That trail is fairly level and there are views, forest, houses, and nature aplenty. To the Quarry & the Houses. The trail is narrow for a ways and there are different kinds of vegetation in this more exposed area which looks quite rabbit friendly. Soon you start down and walk right by an old stone quarry, with blocks lying around still waiting for the last wagon out. It's clear the quarry came later, as none of the ruins you'll see have cut stone. It must have been a small operation, cutting the stone from exposed ledges. They used a wooden derrick to load the stone on wagons or sledges, and you can still see its base with two large holes in a stone along the trail. Abandoned house at San Lorenzo Case, Lerici, Liguria. Church History San Lorenzo was cited by the Bishop of Sarzana in a document in the year 1100, and also listed by the Vatican in 1296 as part of the parish of Trebbiano (on the hill opposite to the north). The church had a rectangular plan and the most identifiable remains were probably also its most prominent features - the bell tower and the semicircular apse covered with a hemispherical vault. No longer discernible, the single nave ended with a robust arch with a herringbone pattern. Other openings were beamed (not arched) - consistent with ancient construction. There is no information on the purpose of the substantial ruins around the church. Of interest is the alignment of the church - its long axis aligns exactly with sunrise / sunset on the spring and fall equinox. See more photos and info at Cavanei, Barbazzano, Storie e Notizie del Monte Caprione di Lerici (IT). The opening forming the farfalla. The Menhir and the Farfalla Dorata Also called a 'quadralithon', these rocks are possible evidence of early astronomy according to a Signore Enrico Calzolari (Farfalla Details (IT)). Around the time of the summer solstice dozens of visitors come to see the Golden Butterfly. It occurs when the rising sun shines through the space between the three southern rocks, a spot of light in roughly the shape of a farfalla (butterfly) appears on the more northern rock - the menhir. The phenomenon is now well publicized by websites both reasoned and nutty, but there doesn't seem to be an archaeologist on board. The question is: was the rock knowingly placed there to acknowledge the solstice? Like us, you get to make up your own mind whether it's the hand of early man or geologic happenstance. The butterfly appears best for about 15 minutes just after 8am in the period from June 15 to June 28. Seggio (Base) for the Macina a Remo which ground grain. Macina a Remo This ancient, unique massive stone base with a deep groove is a seggio. It is used with a grinding stone on a pole (macina a remo) as an early labor-saving device to mill grain. This is one of only three known in the region, including one on the Island of Tino, and one in the abandoned village of Barbazzano above Lerici. It is super old - see how the limestone is weathered even on the working surface inside the groove. One theory is that the technique originated in the Western Mediterranean and was brought to Tino by Byzantine monks over a thousand years ago. It was operated like this: the pole (remo) served as an axle for a vertical circular grinding stone (macina) allowing the stone to roll within the groove in the base, while one end of a pole was anchored, and the pole was moved back and forth to effect the grinding. The pole provided leverage and a handhold for one or two people to create a rocking and rolling grind. Not fancy, but much easier than hand methods in a time before water or wind power milling. There are photos and a sketch with cool cavemen: here: Anthropology Magazine, 1998 See a detailed macine article at Cavanei, Barbazzano, Storie e Notizie del Monte Caprione di Lerici (IT). CAI - Club Alpino Italiano. Thanks to these volunteers, the Lunigiana area enjoys many well marked trails. The website for the Sarzana unit is CAI Sarzana, the office in Sarzana has many maps for sale and is open from 5-7 PM. Maps Online: CAI Sarzana Online Trail Map. Thanks to Gino Cabano and his Facebook site: Cavanei, Barbazzano, Storie e Notizie del Monte Caprione di Lerici for lots of this information. Mr. Cabano has authored several books on the Caprione and has explored it exhaustively. Follow his site which helps advocate for its preservation by showing the wonders and the history of the Caprione..
* Macchia is Italian for the shrubland biome in the Mediterranean region, typically consisting of densely growing evergreen shrubs such as holm oak, kermes oak, tree heath, strawberry tree, sage, juniper, buckthorn, spurge olive and myrtle. It is an intricate ecosystem, highly adapted to the terrain, rainfall, and weather.